While we wait for market research firms to crunch the overall Q1 2019 smartphone shipment numbers, most likely reiterating the industry's recent decline, yet another report looks back on 2018 with an interesting focus on the premium ($400+) segment. This actually had a pretty great year, posting healthy 18 percent sell-through growth compared to 2017 mainly thanks to Apple, Huawei, Oppo, and... OnePlus. The makers of the incredibly popular OnePlus 6T managed to break into the top five global premium brands in 2018 after accounting for a measly 1 percent of the segment's shipments around the world in 2017. Although the company's year-on-year jump from 1 to 2 percent market share doesn't exactly sound massive, that actually equates to a staggering 209 percent growth in global sales. Unsurprisingly, Apple held on to the number one spot in premium smartphone shipments last year, with a towering 51 percent slice of the pie that's nevertheless smaller than the tech giant's 58 percent share in 2017. Samsung and Huawei also retained their silver and bronze medal placement respectively, although the former company slipped from 23 to 22 percent market share while the latter cracked double digit territory, at 10 percent, after accounting for 8 percent of the previous year's premium sales. Believe it or not, OnePlus was not actually 2018's top premium performer, as sister brand Oppo somehow managed to boost its numbers by a mind-blowing 863 percent from 2017, jumping to 6 percent share after eating up only 1 percent of the market a year earlier. Of course, Oppo owes its success almost entirely to China, where it followed Apple and Huawei in third place in the premium segment. 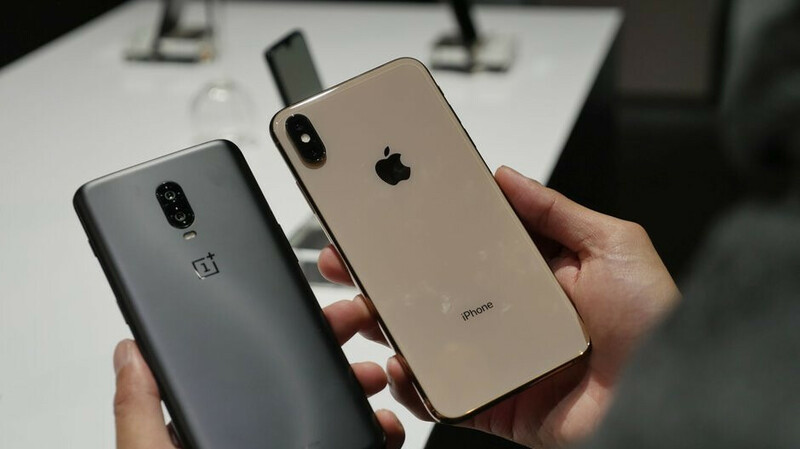 Meanwhile, OnePlus performed exceptionally well in India and across Western Europe, also breaking into the US top five chart during Q4 but ultimately yielding to Apple, Samsung, Google, LG, and Motorola in North America as far as full-year shipments are concerned. By the way, Google had a decent 2018 as well, winning the bronze medal in North America and ranking fifth in Western Europe's premium segment, behind Apple, Samsung, Huawei, and OnePlus. Well Apple holds 50% of the market so that Apple can lose the most. However, Apple has iOS and that can protect them quite good. Leaving an Eco System is never easy especially when you have used it for years. I tried it myself and bought a Sony or Galaxy S8 but I always went back to iOS. I also think that Apple has competitive products in the meantime. Well, Apple have the ios leverage. Samsung has innovation and brand recognition. As long as the US government works to keep Huawei out of the US, I see no threat. iOS has no competition so they will remain on top of premium, its samsung losing bad to chinese phones. Fortunately for Samsung, they have like 50 other successful divisions that earn them more money than their smartphones anyway. I'm least worried about them than any other of these companies. But those doesn’t run iOS. People who buy iPhone already spend their money very wisely, they want to have great experience everytime when they use their devices and also when they want newer model they know their current device has great resell value.